There are fourteen views of this project on this page. 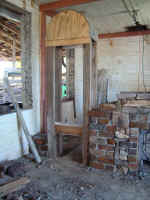 Tom and Heather LaGarde live in a former dairy, which includes several outbuildings formerly associated with the dairying activity, and in particular a brick milk cooling building attached to the old hay and cow barn. 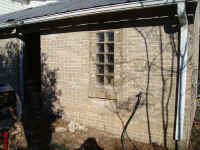 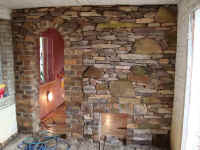 Click on any pic for a larger view Tom, who hails from Michigan, wanted to turn the brick building into a sauna by building a stone wall dividing the space into two rooms, and putting glass brick into the window spaces. 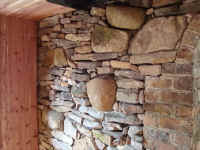 He had a lot of local stone, mostly granite and basalt, and a lot of old brick. 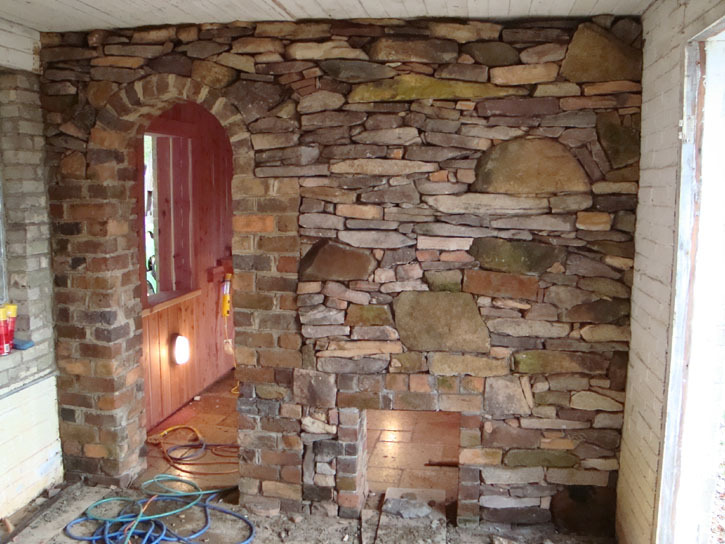 I bought a pallet of “Salem” weathered sandstone from Scott Stone in Mebane, as I knew I’d make much quicker progress with some more workable rock, and then scattered the big hard rocks here and there in the field. 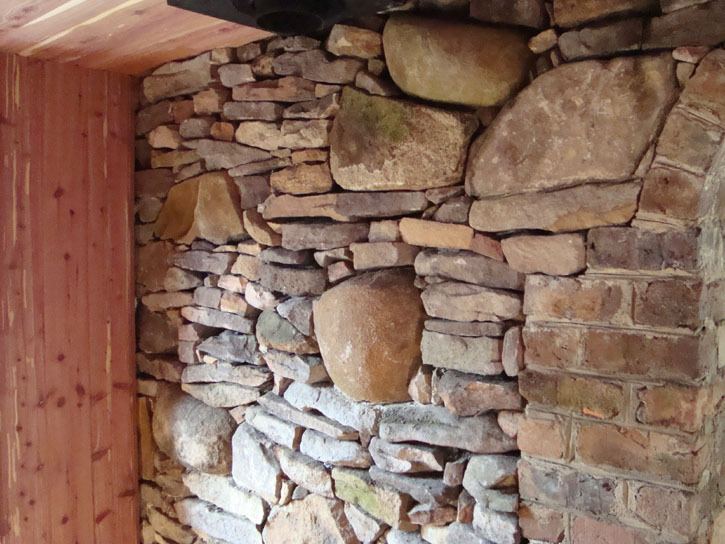 Plus, it’s my favorite “look”—a mix of thin stones that “flow” around and over big boulder-like pieces much like water in a stream strewn with boulders. 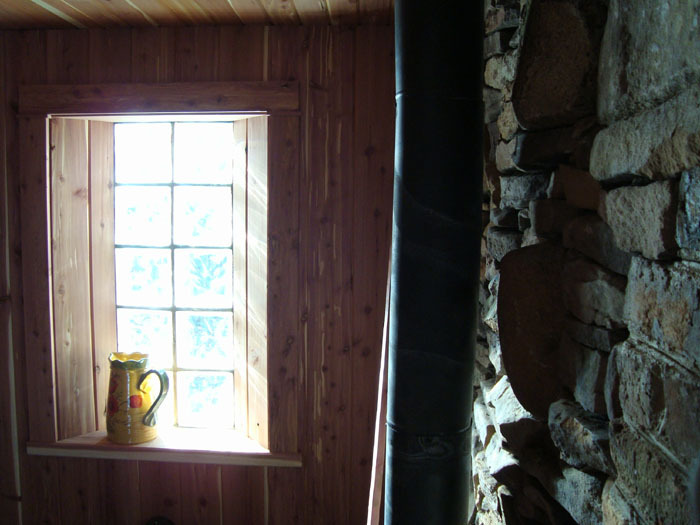 While I was laying up the brick and rock, Tom paneled the sauna room with red cedar. 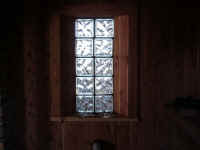 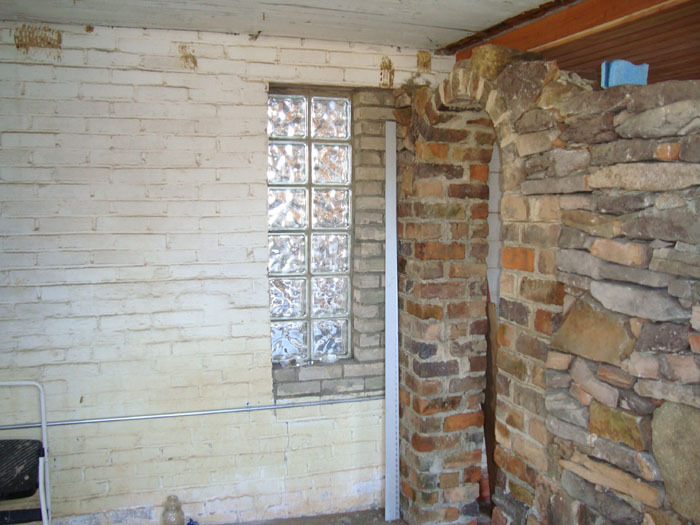 The first glass brick window, in the outer room, was something of an experiment. 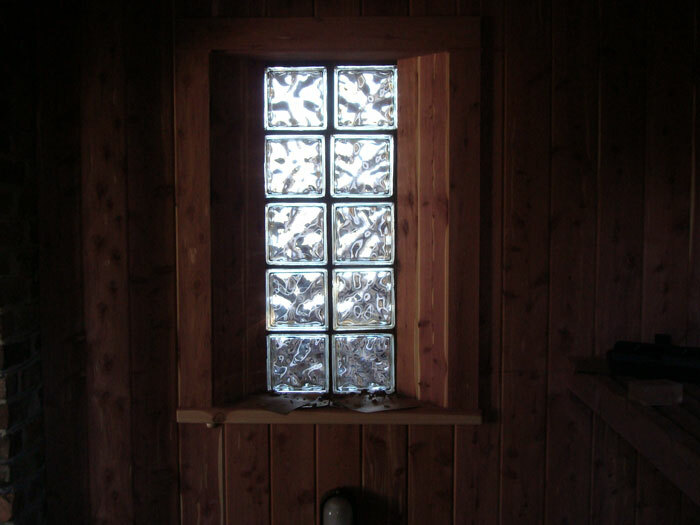 The cedar panels at 45 degrees were a more beautiful solution to the windows in the sauna room (where people will mostly be sitting). 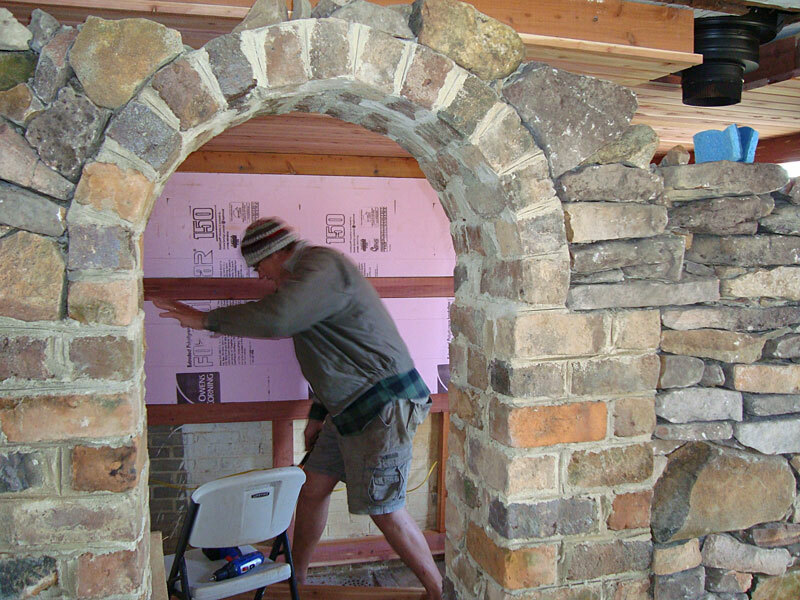 There will be an arched door hung in the brick arch, which I built over the form shown in the earlier shots. 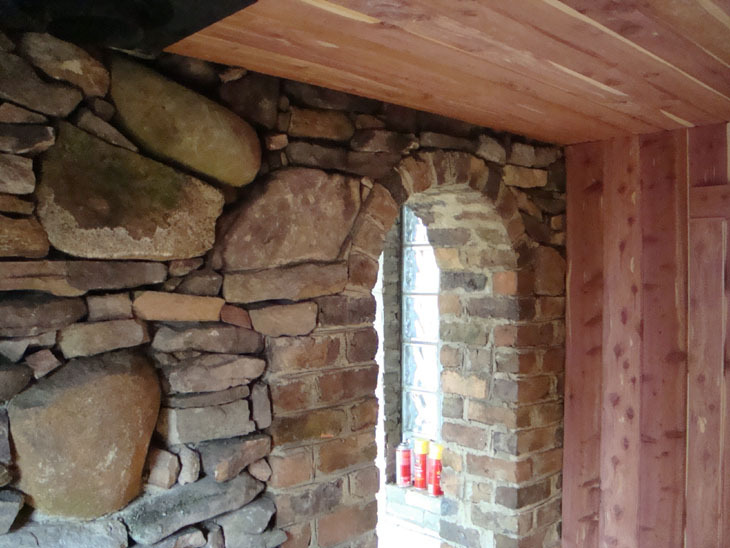 I laid three oak blocks into the arch sides on each side of the arch (which you can see if you look closely), as nailing or screwing surfaces for the door frame. 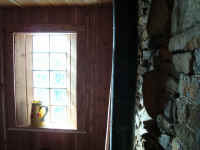 About half way through my work, the floor was tiled, as you can see in later photos. 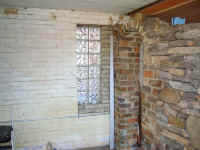 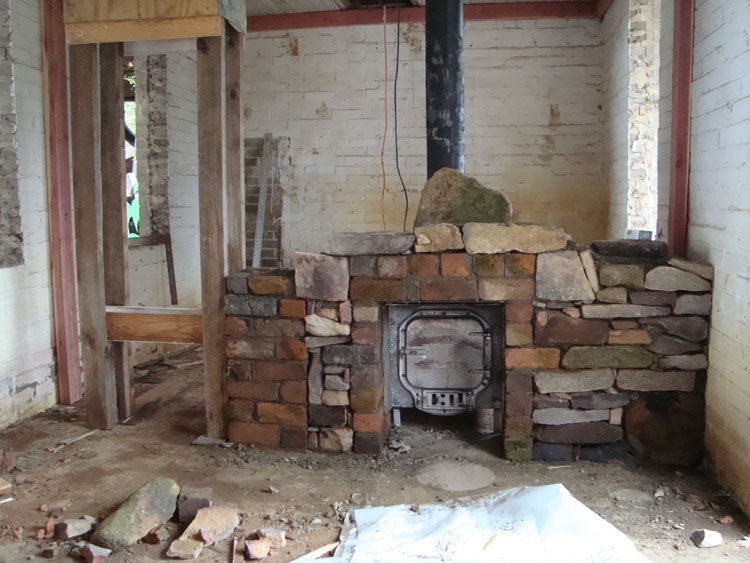 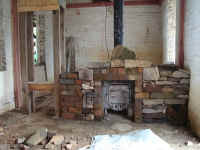 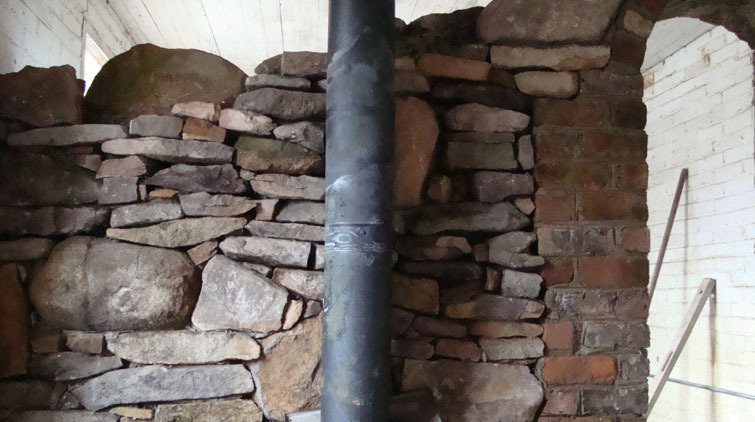 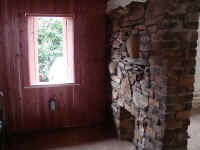 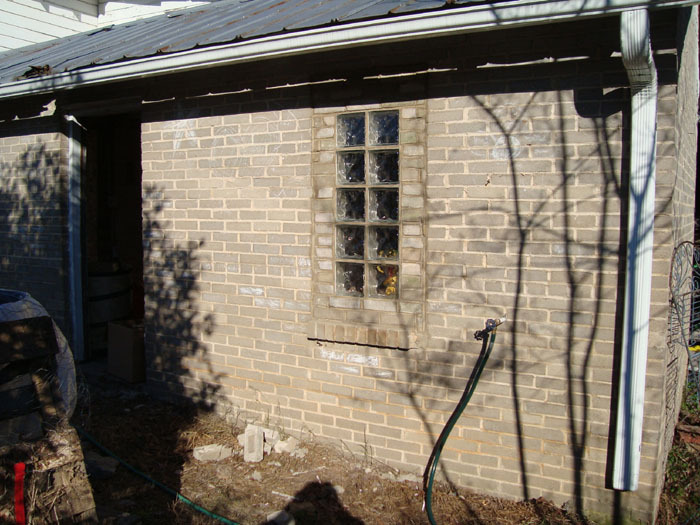 To do the tiling, the stove was removed (having been the “form” for the brick surrounding its intake). I used two heavy 4”X4” steel angle to carry the brick and wall over the stove. The stone wall is “dry-laid,” with concrete and some brick filling all the interior spaces. 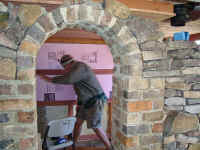 My “numero uno helper” wanted to go in and out of the arch form, “adjusting” it several times to her liking. 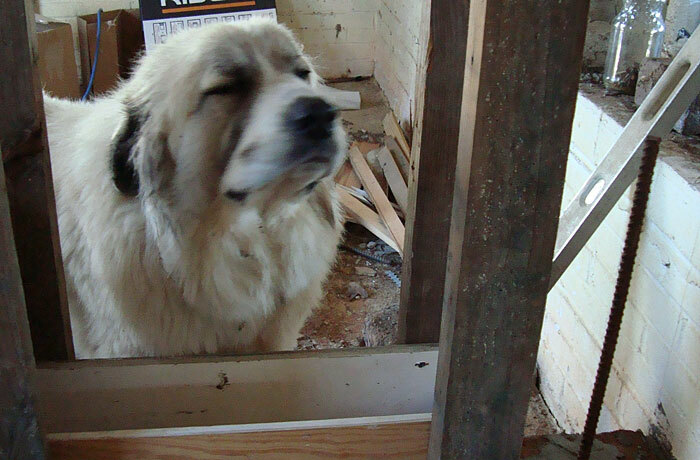 She mostly slept, however, so I never paid her for her work, figuring that my company was enough reward.